Inspired by the Nexus One (which HTC made), the Desire—or Bravo, if you prefer—has a 3.7-inch AMOLED screen with multitouch, with 480 x 800 pixels. It's the best display I've seen on a phone for a while. Internally, a 1Ghz Snapdragon chip, 512MB of ROM and 576MB of RAM, 1400 mAh battery, Wi-Fi, Bluetooth and GPS all lurk. The camera is 5.0-megapixels with autofocus and flash. 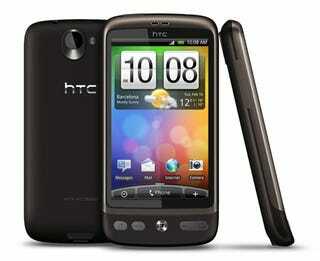 It's running Android 2.1 with HTC Sense, and will be available in a couple of months time. It's better-specced than the Legend, but with those looks, the Legend will steal the show I'm sure. Those that watched the Nexus One announcement unfold but wished that HTC had plugged its cool Sense overlay onto the phone will be pleased, as this is what the Desire is all about. Essentially it's the same phone as the Google Nexus One, with the slim 11.9 depth chassis and smooth exterior making it a real joy to hold in the hand. It's a little on the large side thanks to packing a 3.7-inch OLED screen, but HTC has had a look at the few foibles the Nexus One has and sorted them out on the Desire. The main difference lives on the front of the phone - the trackball has been replaced with an optical option instead, meaning a less tactile feel when trying to navigate through menus. It's not a real negative point though - it's just that some people might have to take a while to get used to not actually scrolling anything physical. The touch sensitive buttons on the front of the HTC Desire, which our review pointed out were a little bit fiddly, have been replaced by physical keys, which respond nicely to the touch and allow easier access through the phone. The Sense UI is back in force on top of Android 2.1, and it's even more cracking than before. The phone is fully multi-touch enabled, and this is never better exemplified than in the Leap view. Simply pinch inwards on one of the home screens, and the Desire shows off all the currently running displays in an easy to poke format, meaning no more scrolling to get to the other end of your screen. The WVGA screen is just tip-top for multimedia as well - we've moaned in the past that the Android music player is staid and boring. But we're glad to report that this element has been put right with the Sense overlay, offering you the chance to slide through artists, albums and songs at the bottom of the device. Video on the Desire also looks great, as you might imagine - you can watch all variety of codecs on the phone and the 3.7-inch OLED screen gives some scarily deep blacks and lovely colour saturation, as well as a terrific response time for fast moving scenes. The internet browser on the HTC Desire is up there with the best of them - we managed to load a couple of fairly heavy websites in a few seconds - over an EDGE connection, which is miles faster than most competitors. We're mightily impressed with the HTC Desire, and can see that this is going to be a real iPhone contender in 2010, no matter what Steve Jobs brings out later this year. Photos courtesy of Tech Radar.